The Billionty-Oneth Geek: ROBOPOCALYPSE by Dan Wilson, Ph.D.
ROBOPOCALYPSE by Dan Wilson, Ph.D.
From the mind of Dan Wilson, Ph.D., author of such works as How to Survive a Robot Uprising and Bro-Jitsu: the Martial Art of Sibling Smackdown, comes Robopocalypse; an oral retelling of the global robotic takeover. The book takes us through the history of the robot war – from the inception of the robot virus, to the robot uprising, the human uprising and the aftermath. The story is told through a number of different voices – from people who were key to certain movements within the crisis. Before I picked up the book, I skimmed through some reader reviews. A common complaint was that the story was too similar to World War Z. At first when I started reading the book, I thought the same, but as the story progressed, the similarities seemed few. There are similar concepts between the two books; both tell stories of the end of the world and both provide a collection of perspectives. At least to me, that’s just about where the similarities end. WWZ gives you a wide range of tales spanning the globe in order to paint this landscape of what the world would look like post-zombie invasion. It is a divergent outlook. Robopocalypse is different in that you have a handful of storytellers, concentrated within the United States, strung together with a more conventional narrative. Compared to WWZ, the direction is more convergent. It is not necessarily told to draw that grand picture that World War Z seeks to do, but rather tell you more of a singular story. The number of perspectives broadens the reach. In that sense, the storytelling style is more similar to Generation A than WWZ. I know a lot of people enjoyed WWZ, so unfortunately, I fall into the minority of folks that didn’t really enjoy it. I prefer just a straight up story, with a linear narrative. I didn’t care so much for the broad strokes of which that story employed. 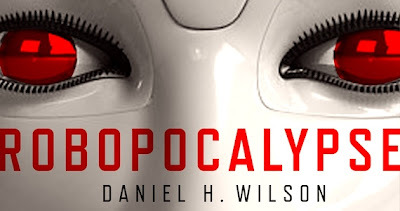 And so conversely, I enjoyed Robopocalypse. Admittedly, it took a number of chapters before I got into the story. It wasn’t until I realized that it had a smaller scope that I started to enjoy the book more. The story isn’t the greatest and it won’t blow you away, but it’s a fun take on the apocalyptic and post-apocalyptic genre. Interestingly enough, both books after their release were optioned by movie studios. We should be seeing World War Z next year, and Robopocalypse (helmed by Steven Spielberg!) is slated for a 2014 release. We’ll see in a few years what makes for a better movie. But until that day, later geeks!